In an assignment inspired by O’Reilly’s “Developer Notebook” series, I have students create a document in Google Docs and share with the instructor and teaching assistants. The course is titled CEP 820: Teaching K12 Students Online and the final product of this particular assignment is a “Notebook” companion to an online course module they develop over the semester. This notebook is meant to be shared with peers in their particular grade level and subject areas. Since this is an “in process” writing assignment, we chose to use Google Docs over a blog because it allows for frequent revisions, feedback and iterations before polishing and publishing to a wider audience. 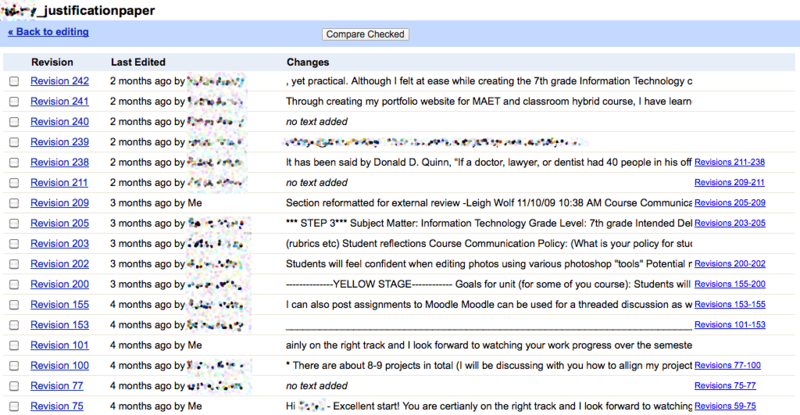 Google docs has proven to be a great tool for facilitating the feedback and writing process with our online students. This is an excellent framework to co-opt for the developer notebook assignment. The products the students create will be usable (and enjoyable) to a wide audience and fill a niche that does not currently exist at that level of specificity. There are many “how-to” create online courses or use course management software books — but very few specific resources for teachers to reference when developing for their own grade level/subject area and CMS of choice. The ultimate goal of the notebook is to have something the students can publish and share with colleagues who are going through a similar development process. 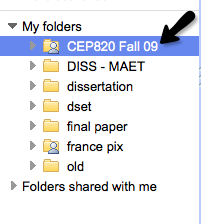 We have a wide spectrum of subject areas/grade levels and CMS choices in CEP 820. For example, a 3rd grade teacher may be producing a notebook on how he created his unit in Moodle; an earth science teacher may be developing her course using Ning and so on. GREAT, HOW DO I DO SOMETHING LIKE THIS IN MY COURSE? Google Docs is an incredible collaboration and productivity tool. This is the “anchor” tool in CEP 820. In each of our courses, we try to choose 1 technology to focus on — in this course, the majority of our written work will be facilitated through Google Docs. Of course we will experiment with lots of other technologies along the way, but we expect you to become highly proficient in the use of Google Docs for collaboration. Now, there are many alternatives to Google Docs that you should be aware of Zoho, Office Live, Buzzword, & Peepel (to name a few.) We have experimented with all of these tools and have chosen Google Docs because of its ease of access, usability and reliable infrastructure/backbone. (What is the site most people go to when troubleshooting web connections — Google. If Google is down, you know there is a problem!) Additionally, Google has made a concerted effort to connect with the educational community and has created a wealth of resources for the K-12 and higher-education worlds. This is not to say that the other tools do not have competitive advantages over one another, but we don’t want the technology to get in the way here. This course is about learning how to teaching online, not learning how to use every online productivity tool. There are several tutorials available if you are unfamiliar with the ins and outs of Google Docs. We have a wide range of experience in this class, from novice to expert. One advantage to learning and teaching online is that we have an extraordinary amount of leverage in delivering technical support to you. There is a basic level of understanding that you need to complete the assignments. As a college, we have a subscription to Atomic Learning. This is an EXCELLENT resource for step-by-step tutorials to give a basic understanding of the capability of software. Now, if you already know Google Docs very well, you can go above and beyond the requirements by exploring these advanced tutorials on the Google Docs Community channel on YouTube. If you’re still getting your feet wet, you can bookmark the channel and save it for later! 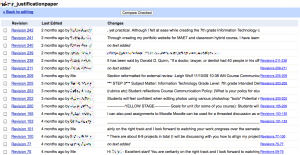 We are going to use a Google Spreadsheet to help track your progress this semester. Actually, it’s beneficial for you AND for instructors. It gives you a clear idea of due dates for the “big” assignments in the course and helps us, at a glance, see how you are progressing. One of the first questions I always get when showing the assignment tracker is “what if someone goes in and deletes all of the data?” As you learned in the tutorials, there is a handy “view revision history” feature that lets us see who has made changes to the document (we also have set notifications for the edits!) No grades are every displayed on the spreadsheet, it’s just a nice, clear way of seeing assignments and due dates throughout the semester. In the brief video below, we give you an introduction to the Assignment Tracker. We’ll give more information on the assignment tracker in Chapter 2 — for now…let’s get going on your tasks. You’ll know your dorm name by looking at the name of your dorm under “Lessons” in ANGEL. <instructor/ta emails> – give us rights to edit. As you learned in the lab, the development of the notebook will be achieved using a shared Google Document. This will allow us to track your progress over the semester and provide feedback to you in one tidy learning space. During this course we asked you to leave your reservations on the virtual doorstep and for many, the following request may cause a bit of anxiety as the process of “formal writing” tends to conjure up tummy aches and grumbles. We are intentionally leaving a rubric out of this stage in the writing process for several reasons. First and foremost, we are in the first chapter of the course and you have not been exposed to enough theory and practice to write a paper on the potential pitfalls and praxis of online learning. There is no “right or wrong” in this notebook — the key is learning how to communicate. With that said, in the entry one stage, we need you to do some initial brainstorming for the development of your course — believe us, things will change as the semester moves along — it’s all part of the process! • What do you want your course to look like? • What your ideas/thoughts/dreams for class interaction for both teacher and students? • How do you think you will assess students? • What are some of the social, ethical, legal, and human issues surrounding the participation in your online course? If you wish, a good way to start, may be to copy and paste the questions above and write a few paragraphs under each one. Citations are not necessary. There is no proper order, let your questions, concerns & ideas flow! We will be providing detailed suggestions on the ideas you present. Our goal here is to help you become better communicators and to think through all the things that are involved in online course development. When we provide feedback & constructive criticism to you, we ask that you do not fear that you are “failing.” We want you to get the most you can out of this course! As you saw in the lab above, we use Robin Dickson’s Google Spreadsheet “Assignment Tracker”to articulate expectations and check-in points. Setting specific check-in/due dates helps the iterative process of the writing and feedback reinforcing that this is a real-time, live, engaged writing process with and between student and instructor. In Fall 2009 this assignment was called a “Justification Paper” — the word “paper” put an extra layer of anxiety and expectation on to the students so this semester, I changed the assignment to a “notebook.” This twist more accurately represented the iterative nature of the assignment and I am hoping it will help to clarify the expectations and put more emphasis on the writing and revision process. Last semester, for th e final “paper” entry, I required the students to delete the progress they had made and summarize their thoughts into a short essay. I found it interesting that many students wanted to share a new document instead of making changes in the existing notebook. I tried to articulate that your work is never really “lost” with Google Docs due to the history and revision changes. This semester, we will integrate the history and revision changes more tightly into the writing process so students can see the power (and purpose) of the history revision feature. From a time management perspective – it is fairly time intensive (we had 40 students last semester) – however, for me the investment paid off. From an organizational stand point was so much better than passing around .doc files, checking blog postings, or editing on a wiki. The “workflow” clicked perfectly and I look forward to editing and revising the assignment to make it even more meaningful and useful to students. From a pedagogical standpoint, students sincerely appreciated the frequent and detailed feedback throughout the writing process (as opposed to “final” feedback with no opportunity for revision.) Additionally, when the notebooks are finished they can easily be published, pdf’d or exported to Word for touching up and printing. A BIG thanks to Laeeq Khan, Greg Casperson, and Anne Heintz who have helped with the development and teaching of CEP 820 during the fall and spring and to Dr. Robin Dickson for her innovative use of the Google Spreadsheet Assignment Tracker.